Right here, right now, I'm going to share a fun recipe from a charming little book...the latest Cook the Books selection...The Little White Horse by Elizabeth Goudge. This book is actually a children's book, and in all honesty...I found myself transported back to my childhood when I'd grab a book and not put it down until I was finished! I've always loved to be carried away into a world of fantasy. And this book did not disappoint. The characters were fun and spirited and unique (and I bet if I was still just a girl, I'd be instantly transformed into Maria Merryweather). While Maria has invited only 7 people to her gathering, Marmaduke starts absent-mindedly rambling off a list of the goodies he will make which include plum cake, saffron cake, cherry cake, iced fairy cakes, eclairs, gingerbread, meringues, syllabub, almond fingers, rock cakes, chocolate drops, parkin, cream horns, Devonshire splits, Cornish pasty, jam sandwiches, lemon-curd sandwiches, lettuce sandwiches, cinnamon toast, honey toast.... Maria interrupts his train of thought and wonders how 7 people could eat all of that food. To this Marmaduke responds, "I always like to be prepared for more guests than are actually expected. Also I gathered from the tone of your voice that this tea-part was to be a great occasion, and great occasions need to be greatly celebrated....The bodily sustenance of the inner man as well as the aesthetic satisfaction of the outward eye should be on a lavish scale." See....a true slave to the trade....an old-school foodie! I had a very hard time choosing something inspired by this book to make...and not because I wasn't inspired...I was! I think there were just too many things running around in my head and I couldn't pluck out one single idea separately. I finally decided on a simple thing which I remember Maria seeing...a pretty little bowl of candied cherries (in a silver dish p. 126). This stuck with me, and I knew they were something I wanted to try making. I saw a recipe for candied apples over at Coleen's Recipes, and she suggested other fruits you could candy with the recipe as well...so I used this! 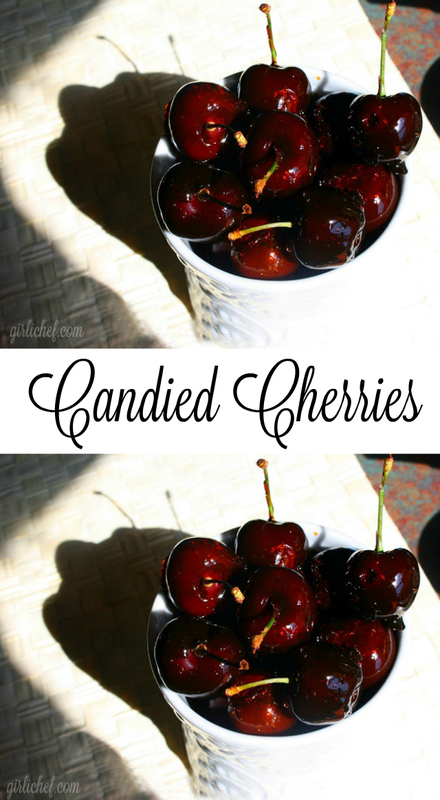 Fresh sweet cherries coated in a thin, crispy candy shell. 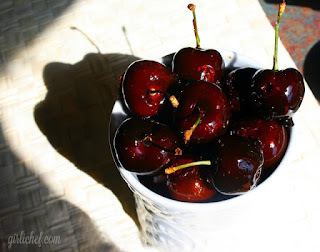 Wash and dry pitted cherries. Line a baking sheet with wax paper and spray with non-stick cooking spray. In a heavy bottomed sauce pan with a candy thermometer clipped on the side, put all ingredients except cherries. Over medium-high heat, stir until mixture comes to a boil. Then STOP stirring. Turn heat down to a gentle boil and cook until it gets to 300° F (watch closely once it hits 285°, it will go fast!). 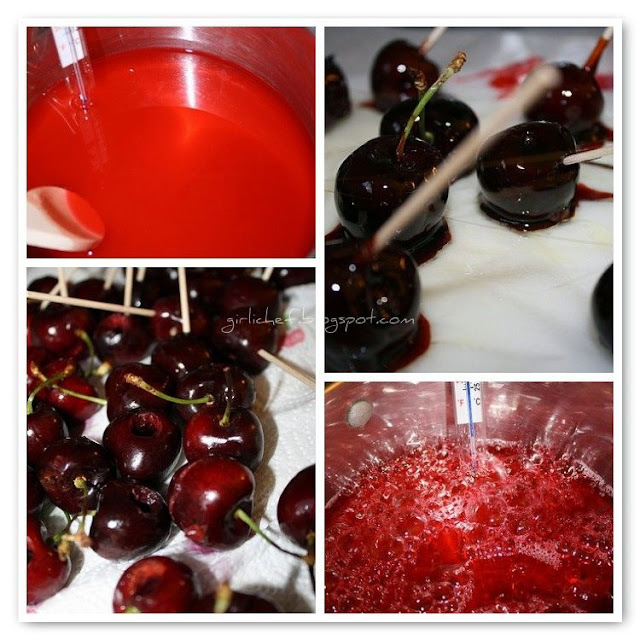 Remove from heat and tilting pan and working quickly (be careful...hot sugar is dangerous), hold cherries by stems (or toothpicks if they don't have stems) and dip into candy mixture, twirling and letting excess candy drip off. Set on waxed paper and repeat until all cherries are done. Transfer them to a little serving dish and set them on the table for children to find and squeal in delight at the combination of fruit and candy! While today is the last day for entering your recipes inspired by The Little White Horse, it's just the beginning for our next book selection. Head on over to Cook the Books to join in!